The Sacramento Recycling and Transfer Station (SRT) is Sacramento County’s one-stop-shop for waste disposal needs. 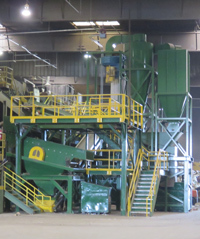 The 17-year-old facility provides safe, reliable and environmentally sustainable recycling and disposal services to county residents and beyond. SRT is owned and operated by Waste Management, the country’s leading environmental services company. The 19-acre property combines four distinct operations under one roof using a staff of more than 130 employees to ensure waste is properly sorted to maximize diversion and help our communities reach California’s recycling goals. The facility includes a transfer station, recycling center, household hazardous waste and e-waste collection site and coming soon a WM Earthcare landscape center! Click here to watch a video to learn more about SRT. Click here for 2018 rates. If you have a question about your Waste Management bill or want to pay in person, please visit our Sacramento Valley Office at 8761 Younger Creek Drive in Sacramento or call 916-387-1400. Monday - Saturday 8 a.m. – 5 p.m.
Tuesday – Saturday 8 a.m. – 5 p.m.
SRT processes more than 10,000 tons of recyclable materials per month collected from throughout Northern California.